O Romanov, Romanov, wherefore art thou Romanov? As anyone who knows me well will tell you, I love the Romanovs. 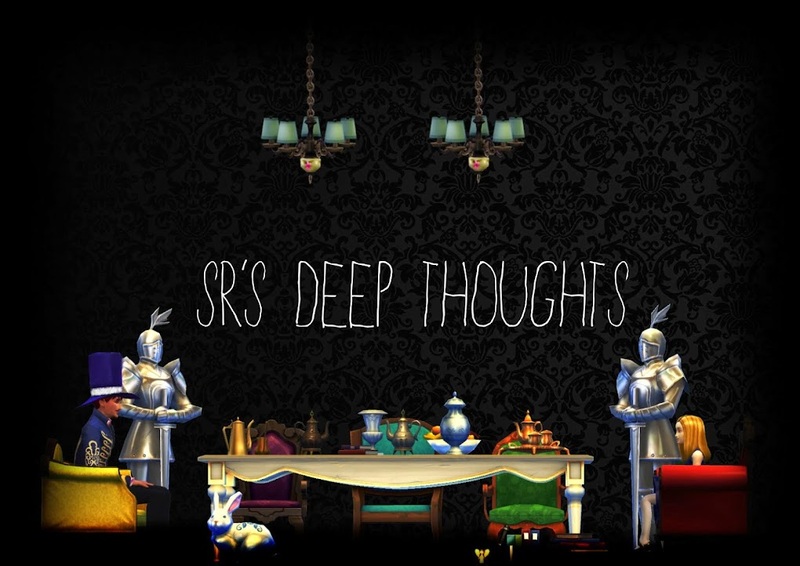 (the 'R' is SR's Deep Thoughts actually stands for Romanov). But I must confess it can be confusing trying to learn about that family. The problem lies in there habits of naming children after other people in their family. For example there was this guy named Nicholas, he had a son Nikolai and a daughter Maria and another daughter Alexandra, he also had a daughter in law called Alexandra, plus he had a son Alexander. Well Alexander married a girl named Marie Alexandrovna, they had a son Nikolai, a daughter Maria, a daughter in law Alexandra and a son Aleksei as well as son called Alexander who married a girl named Maria (who had a sister Alexandra). Well they had a son Alexandr and also a son in law Alexandr, plus another son Nicholas, who married....guess who? That's right Alexandra and they had a son Aleksei and guess what also a daughter named Marie. All that money and they couldn't even afford new names for their babies! In fact here lies the robin of user name double ups. For you see when a man became Tsar if there had already been a Tsar of the same name (it happened a lot) you became "such and such" the second. It would have saved some hastle if they had if just been more original in the first place. But isn't her name Alix? The Romanovs, like many royals, also had a terrible fondness for renaming themselves. Whenever something monumental happened, like a religious conversion or a coronation or a marriage you could elect to take on a new name. You could swap your current name for a new one, add a new one on, the only thing they never seemed to do was drop an old name. For example Alix of Hesse has about one thousand different ways of saying her name. When she got married she became Alexandra, but the funny thing is with Russian names, they can be translated in many different ways too. Don't even get me started on the titles! Grand this, duchess of that, tsarina of that one, empress of that empire! Whatever happens to good old 'Queen'. Names carried a lot of meaning in these circles though. Perhaps the most famous of the Romanovs is the daughter of Tsar Nicholas and Alix/Alexandra, Anastasia. Anastasia' name derives from the Greek word Anastasis, which means "to stand again [from the dead]" therefore it's English equivalent is Ressurection. It can also mean "breaker of chains" that is to be free of the chains of death. In honour of her birth, Anstasia's father released a number of prisoners giving them pardon - therefore breaking the chains so to speak. After her and her family vanished many rumours abounded about her survival. Fuelled in part by the meaning of her name. Would this daughter of the Tsar live up to her name and rise again? (Sadly not, as it happens she died with her family, all of them executed). Names are funny things. They have meanings but at the same time these meanings usually have no real relevance on their carriers. If you really want to have some fun, look up the urban dictionary definition of your name. Also a small shout out to my friend Amelia, whose name means Industrious One, and also currently holds the top spot for most popular new born girls name in England and Wales. They usually did that because Alex, Nick, or Marie was somebody important or special to them. What I love in Russian naming are all the patronymics. Read 'War and Peace' - it'll make your head spin. Patronymics! That's the word I was trying to think of. I was reading about it the other day and I had total mind blank. I have yet to read the classic War and Peace, I did once read a book called One Night in Winter by Simon Sebag Montifiore, nowhere near the status of W+P but it sure had some big ol' Russian names, enough to confuse my poor simple brain. If you have a couple of weeks give 'Anna Karenina' a spin. It's lighter than W&P but with just as many patronymics. Just make sure not to read too much from Russian authors. Gets depressing after a while.